Why Boxing Training Will Get You Fitter - Right Now! You are here: Home / Blog / Why Boxing Training Will Get You Fitter – Right Now! Why Boxing Training Will Get You Fitter – Right Now! Boxing. The toughest sport in the world. Naming any one sport the most difficult of all might cause some arguments! Some people may think that learned skills are harder to acquire than brute force. Others may question the more complex neurological skills such as hand-eye coordination. What exactly are the hardest skills to master? And does coping with nerves or working through pain count too? Even in terms of physical demands – what’s more important – cardiovascular fitness or upper body muscle strength? And what about team sports, how do these fit in? ESPN conducted a degree of difficulty project, enlisting a panel of experts to look at 60 different sports. Each sport was rated according to a list of athletic difficulty factors. 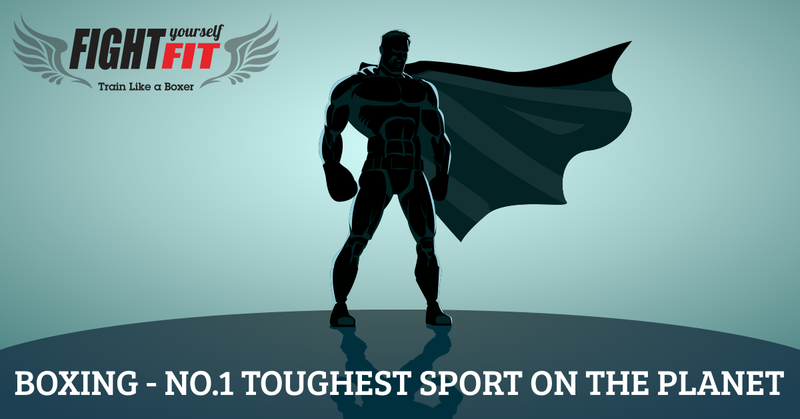 The results – boxing was ranked the hardest of all! For this quest, ten different categories were identified and panel members were asked to rate each sport according to how much of each factor it requires. The categories used were: endurance, strength, power, speed, agility, flexibility, nerve, durability, hand-eye coordination and analytic aptitude. The results from panel members were averaged for each category and boxing was the clear winner, being crowned the toughest sport in the world. 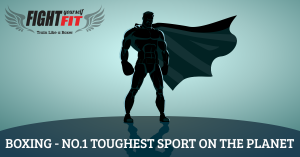 According to this study, boxing is harder than football, basketball, wrestling, martial arts, tennis, gymnastics, swimming, surfing, cycling and rugby and many many more……. Some sports demand more of a multiple skill approach and I think boxing is one such example. Boxing can defend it’s title as the number 1 toughest sport – I’m sure of it! Yes – you do need to be very strong and develop serious muscle endurance in order to last in the ring. And boxing requires maximum cardio fitness. No arguments there. But it also demands mental focus. A good boxer will remain calm, focused and coordinated, even when being hit. This is much harder than it sounds. We know how tough boxing is. We know how demanding boxing training is and we know it gets results fast. Boxing training uses the whole body, and demands full concentration and effort, 100% of the time. Boxing training uses cardio and strength training, and pushes people to their limit. A heavy punch bag can weigh up to 100 pounds – repeatedly hitting such a heavy bag is a seriously demanding past time. Punching for 2-3 mins at a time gets those muscles working and the nerve cells firing! Boxing training provides a high intensity workout with no escape. It demands 100% focus, 100% effort. No excuses. If you want a challenge and a chance to try the hardest sport in the world – please have a go at boxing. No need to step in the ring, no need to get hit. Boxing training will give you all of the benefits with none of the risk. The best of both worlds. A chance to test these assertions and get a great workout along the way. Boxing training improves overall fitness, works every major muscle in the body, and improves hand-eye coordination, mental focus and clarity, and both physical and mental agility. Boxing training reduces stress and encourages body fat loss. Muscle gain is an added bonus! If you think you’ve got what it takes then join us at Fight Yourself Fit and start your training today with former boxing world champion Cornelius Carr. Our online programme is designed to teach you the boxing basics and get you fighting fit in just 60-days. A full workout schedule is provided along with over 5 hours of boxing training for you to follow. 30 minute workouts fit easily into your daily schedule and encourage maximum fat loss. So what are you waiting for, boxing has been crowned the number 1 toughest sport. Time for you to try it and see what all the fuss is about.. Believe. Train. Box.